While recent news headlines focus on escalating tensions between Iran and the United States over Iran's nuclear energy program, less attention has been paid to the United States' Iranian-born population. This spotlight focuses on the Iranian foreign born in the United States, examining the population's size, growth, and geographic distribution over the last three decades using data from the Census Bureau, the Office of Immigration Statistics (OIS), and the U.S. Department of State (DOS). OIS and DOS data were used to measure migratory flows while the census was utilized for stock data. 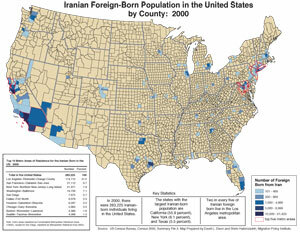 The Iranian foreign born are a relatively new population whose migration to the United States was concentrated around the years of the Islamic Revolution (1978-1979). Between 1980 and 1990, the number of foreign born from Iran in the United States increased by 74 percent. 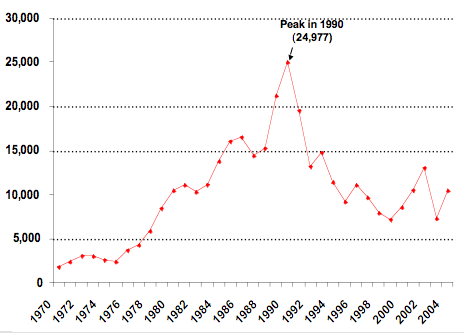 The number of Iranians granted lawful permanent residence peaked in 1990, with an estimated 24,977 Iranians admitted. From 1980 to 2004, more than one out of every four Iranian immigrants was a refugee or asylee. There were about 280,000 Iranian born in the United States in 2000. Immigrants from Iran accounted for less than one percent of the total foreign-born population. Between 1990 and 2000, the number of Iranian foreign born increased over 34 percent. Over half of all Iranian immigrants lived in the state of California in 2000. The metropolitan areas with the most Iranian immigrants were Los Angeles, San Francisco, New York City, and the Washington, DC-Baltimore metropolitan area. During 2005, 5,314 immigrant visas were issued to Iranians. 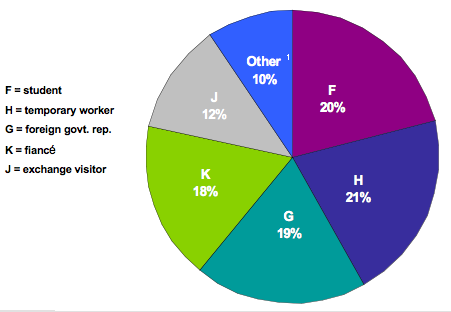 In the last five years, the most commonly issued nonimmigrant visas for Iranian nationals have been the student (F), temporary worker (H), and foreign government representative (G) visas. Three in every five Iranian immigrants were naturalized U.S. citizens. Over 90 percent of the Iranian foreign born spoke a language other than English at home. The majority of the Iranian born had a bachelor's degree or higher. Nearly two-thirds of the Iranian foreign born participated in the labor force. More than half of the Iranian immigrant population were employed in management, professional, and related occupations. The self-employment rate of the Iranian foreign born was almost double the rate for the total foreign-born population. In 2000, the median income for Iranian-born males and females who were full-time, year-round workers was $52,333 and $36,422, respectively. Iranian immigration can be conceptualized as two back-to-back waves before and after the revolution. The first wave, which started in the mid-1950s and continued until the start of the revolution, primarily consisted of college students, who were studying abroad in order to meet the needs of the rapidly industrializing oil-based Iranian economy, and families closely associated with the monarchy of Mohammad Reza Shah. An estimated population of 34,000 left during this first phase. From the Islamic Revolution of 1978-1979 to the present, a second wave of emigration, primarily exiles, political refugees, and asylum seekers, took place. Approximately 330,000 came to the United States during this period. The exiles were disproportionately members of religious and ethnic minorities, such as the Bahai'is, Jews, Armenians, and Assyrians. Also in the second wave were young men who fled military service and the Iran-Iraq war, followed by young women and families who came for educational and political reasons. The foreign-born population from Iran increased from 121,505 in 1980 to 210,941 in 1990, representing an increase of 73.6 percent. According to the Office of Immigration Statistics (OIS), from 1970 to 2004, 356,642 Iranian-born immigrants were admitted to the United States. The largest number entered in 1990 (see Figure 1). About 13 percent (47,977) entered between 1970 and 1980, while 43 percent (154,857) entered between 1981 and1990, and 32 percent (112,597) entered between 1991 and 2000. Just 41,211 immigrant visas were issued to the Iranian foreign born from 2001 through 2004. Note: This figure includes both immigrants admitted and those who adjusted their status after arrival. Therefore, the 1990 peak is partially a result of people who arrived in the 1980s but did not adjust until the early 1990s. Source: U.S. Department of Homeland Security, Office of Immigration Statistics, Yearbook of Immigration Statistics, 1970-2004. According to OIS, of the 319,075 Iranian immigrants admitted between 1980 and 2004, 83,376 (26 percent) were refugees and asylees adjusting to permanent resident status. According to the U.S. Census Bureau, there were approximately 283,225 foreign-born Iranians living in the United States in 2000. However, the Iranian-American community claims the number is much larger than the Census Bureau figure suggests. Of the 31.1 million foreign born in the United States, only 0.91 percent were immigrants from Iran, according to the results of Census 2000. The Iranian population went up by 72,284 between 1990 and 2000, from 210,941 to 283,225. While all 50 states received Iranian immigrants according to Census 2000, 55.9 percent (158,613) lived in California. The states with the next-largest Iranian immigrant populations were New York (17,323 or 6.1 percent), Texas (15,581 or 5.5 percent), Virginia (10,889 or 3.8 percent), and Maryland (9,733 or 3.4 percent). In 2000, 41 percent (114,712) of the Iranian foreign born resided in Los Angeles-Riverside-Orange County, 10 percent (27,112) in San Francisco-Oakland-San Jose, eight percent (21,971) in New York City, and seven percent (19,726) in the Washington, DC-Baltimore metropolitan area. The next three largest destinations were San Diego (7,675), Dallas (6,376), and Houston (6,287), respectively. According to the U.S. Department of State, the majority (2,900) of immigrant visas for Iranians were granted through immediate relative petitions. Another 1,808 visas were granted based on family preference, and the remainder included diversity immigrants, employment preference, and returning residents and armed forces special immigrants, respectively. Between 2000 and 2005, 20 percent of the 15,824 nonimmigrant visas issued to Iranian nationals were student visas (3,323), 21 percent were temporary worker visas (3,316), and 19 percent were visas issued to representatives of foreign governments (2,987) (see Figure 2). The next two most frequently issued nonimmigrant visas were the K, issued to fiancés of U.S. citizens (18 percent or 2,786); and the J, issued to exchange visitors (12 percent or 1,900). According to Census 2000, 60.7 percent of Iranian immigrants in the United States were naturalized citizens while 40.3 percent of the total foreign-born population was naturalized. Among the Iranian foreign born, 92.1 percent in 2000 spoke a language other than English at home, while 83.0 percent of the total foreign-born population spoke a language other than English. According to Census 2000, 50.9 percent of Iranian immigrants have attained a bachelor's degree or higher, compared to 24.0 percent among the total foreign-born population. Iranian-born immigrants had a higher labor force participation rate (63.1 percent) compared with the total foreign-born population (60.6 percent). Among those in the civilian labor force, 4.7 percent of the foreign born from Iran were unemployed, while 6.8 percent of the foreign born were unemployed. In 2000, the top three occupation categories for the Iranian foreign born were management, professional and related occupations (51.8 percent); sales and office occupations (27.5 percent); and service occupations (9 percent). By contrast, 28.4 percent of the total foreign-born population were in management, professional and related occupations; 20 percent in service occupations; and 19.9 percent in sales and office occupations. According to Census 2000, 11.6 percent of the Iranian born were self-employed workers in their own not-incorporated businesses, while 6.5 percent of the total foreign-born population were self-employed. For the total foreign-born population, the median earnings for male and female full-time workers was $30,288 and $25,260, respectively. Iranian-born males earned 42 percent more than the male foreign born overall, and Iranian-born females earned 31 percent more than the total female foreign-born population. Shirin Hakimzadeh is a recent graduate from the Georgetown University Law Center, where she served as an Executive Notes Editor of the Georgetown Law Journal. Currently, Ms. Hakimzadeh is completing a federal clerkship in the District of Arizona.